My sister’s mother in law is an amazing knitter and kindly gave both my sister and I a selection of Pony bamboo knitting needles, Rowan Cocoon yarn and the Sarah Hatton Knits – 10 simple, cosy projects book at Christmas. My previous knitting experience consisted of a pair of garter stitch legwarmers circa 2007 that ended up different widths and lengths because I didn’t count my stitches and got bored on the second piece. Suffice to say, I didn’t remember any of the very little I’d taught myself back then, and this time round I couldn’t wrap my head around the difference between knit and purl, quite possibly because I was taking multitasking to the extreme: Anyway, back in Cornwall I enlisted the help of my Nan and got it all sorted in my head. Tip for complete beginners: take the time to knit swatches of just knit stitch and then just purl stitch before you try to combine the two in stockinette or rib etc. It’s so much easier if the hand movement and needle position for each stitch has been engrained into your brain a bit. I worked through various wrist warmers, hats and the Gap-tastic cowl seen in my MMM14 post, culminating in these owl mittens, and then I decided the next progression was actual, proper clothing instead of accessories, and found the Divi hoodie pattern on Ravelry. To be honest, it was so long ago (February) that I can’t remember my reasoning for choosing it, but it has a pretty simple 4 row repeat (and only 1 row of those is anything other than straight knit or purl) and I decided a jumper should be easier than a cardigan (based on my vast experience!). 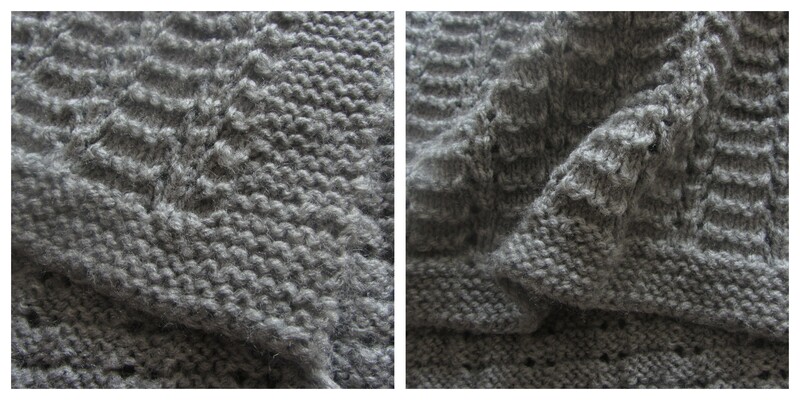 The yarn is some really cheap acrylic stuff from Trago Mills (and is a much lighter gray than in the photos), which definitely doesn’t feel anywhere near as nice as the Rowan but I didn’t want to spend loads on something I wasn’t sure I could or would finish. Cleverly I didn’t do a gauge, but just chose to knit the large, which is meant to give a knitted measurement of 44 inches at the chest, which is way bigger than I need. However, looking at the size of what I’ve done so far, it’s definitely no where near that big, so the finished jumper won’t be as baggy as it is in the model’s pictures. It was progressing pretty well considering I’m not exactly a fast knitter, but then I didn’t touch it for months, which is the reason I’m writing this WIP post. I’ve now finished the back and started the front piece, so I don’t think the end of summer is too unrealistic as a target finish date. I’m thinking now I probably should have looked for a pattern with a knit-a-long or at least more online info/help, as there are parts where I am completely at a loss. Luckily my Nan has been deciphering the secret knitting codes, but she hasn’t knitted much since I was a child and says these newfangled patterns aren’t like the old ones, so there could be some botch jobs in places!